Increase Capacity for Low Voltage Cabling. 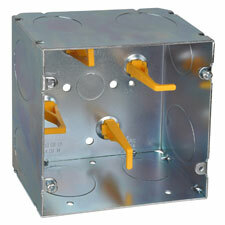 5 SQUARE® boxes offer more than double the cubic-inch capacity of 4-inch square deep boxes and 50% greater capacity than 4-11/16" boxes, making it faster and easier to route wiring and make terminations in the box. Cable management posts ensure minimum bend radius requirements for high speed data cables. When terminating data cables, turn a two-man job into a one-man job by storing the slack cable loop in the box for easy access - eliminating the need for a second technician to access the drop ceiling space where the cable loop is typically stored. Reduce troubleshooting for Fire Alarm Devices. The extra room in the 5 SQUARE® box dramatically reduces the likelihood of ground faults and short circuits when installing large fire alarm devices. Other Products by ABB Installation Products Inc. Many food and beverage plants are installing wall offsets to secure their equipment and service lines away from walls and other permanent surfaces. The SuperClean™ offset allows for 360-degree cleaning of all parts in NFC Zone 2 food and beverage preparation areas, which is a requirement of new food safety standards. The Elastimold® Advanced Connection System – Shear Bolt, ABB Installation Products, installs with a standard wrench and without additional components. The simplified installation of the Elastimold Advanced Connection System – Shear Bolt enables underground cable connections to be made more safely and quickly. Ty-Fast® Ag+® bacteria-resistant cable ties, new from ABB Installation Products, are the industry’s first cable ties to inhibit microbial growth, which helps to reduce infection rates and the spread of bacteria. Testing indicated that common bacteria on the cable ties’ surfaces is reduced by more than 99.9 percent.